Well I do! Seriously. I try to bring my own bag to shop on Saturday, I travel by bike to reduce my carbon prints (and fuel expenses), I refuse plastic bag when I only purchase few items, I like to patron environmental-friendly retail like The Body Shop and recently I started buying Lunatots cloth diaper for Khayla. 1. Friends tell me that it's not really practical for busy working mom like me. Especially since I'm working and studying at the same time so I will not have the time to wash the diapers. 2. It's expensive (during the expo, I bought 3 pieces for RM60+/each), and certainly buying 2-3 is not enough to make economic sense of it. But somehow my colleague managed to persuade me to give it a try. Plus, they have a new model of cloth diaper where the insert is clipped to the outer layer. So when the insert is soiled, all we need to do is to change the insert and not have to wash the whole thing. Just pin the insert onto the outer layer and when it's time to change (roughly 4 hours later, if baby didn't poo), un-pin the insert and change with new one! But then, some of you may argue - kena cuci la, dah la insert warna putih mesti susah nak tanggal kotoran najis especially poo baby! I also thought along the same line but when I tried it, the stains came off easily! Even when Khayla poo in the diaper, I just have spray off the hard stools into the toilet bowl, then put the whole thing in the washing machine. When it's done, tadah, as good as new! 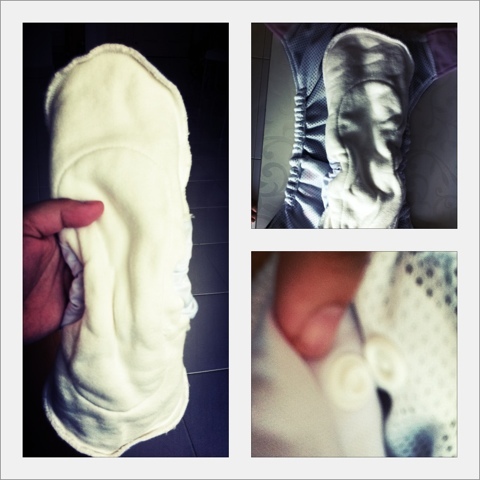 The inconvenience part is actually not that bad, and furthermore I can save 2 diapers per day (coz I only have 3 inserts right now, but I can probably save a lot more if I have more reusable inserts). That means I only put on disposable diapers on Khayla before bedtime and when we are going out (to be fair, the disposable diapers have better absorbency so it can last the whole night so I am still not doing away with it yet). Suami Terchenta however is still not impressed with the cloth diaper idea because it sometimes leaks. So I read up the facts on diyaluna.com website (the genius who came up with Lunatots brand and also a user of Msjbox) and found out that new inserts need to be washed several times prior to use as new clothes still repel water. I only washed it once, and that explains the leaking. Problem solved! 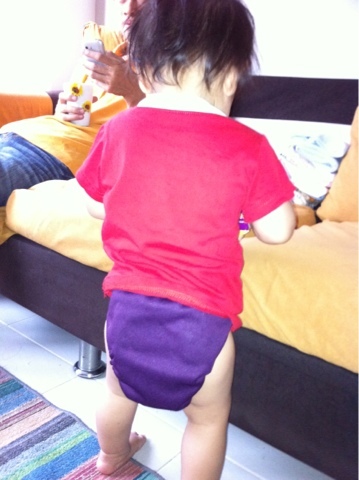 Doesn't it look just like regular diaper, only more chic and stylo? Since I love style, comfort and convenience, this is one purchase that I'm not regretting an highly recommended. Seriously, sangat la senang memakai lampin kain moden jenama Lunatots ni.